Click on the blue map icons to find the best outfitters in the Western USA. 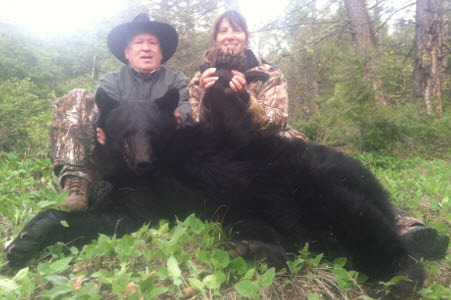 Over the years we have specialized in bear hunting Idaho and have many references. Depending on your personal preference, we can have you drive right into camp or at least to the snowline, if you choose to fly we can pick you up (for fee) in Missoula MT. We hunt from stands and blinds set up always depends on the bait. We consistently produce excellent Bear hunting results, with decades of high kill rates. Contact us and let us discuss the reasons why we are a great choice. Depending on which camp you choose, we have cabins or wall tents for housing. Both have wood heat with comfortable cots and foams. You will need sleeping bags. Bring full camo in layers with a waterproof outer layer. The prices quoted currently include all food lodging as well as full guide service and caping of critters.